Book Online – We now have a great new feature to make your life easier. 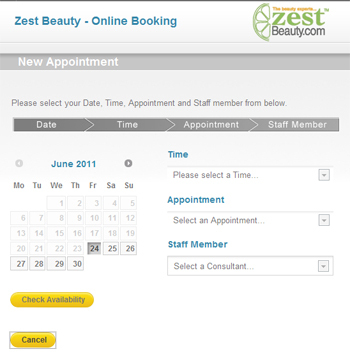 You can now book your treatments online via our new salon web booking system. Once you are logged in to your account you will also be able to see any future bookings you may have. A confirmation email will also be sent to your registered email address. If you are new to our salon at Zest, you may also create a new customer account and book in straight away. We hope you find the new tool usefull, however if not you may always call as usual on 0115 9814436. You may find our online booking is fully booked if your appointment request is within the next 7 days, so please call us on 0115 9814436 like usual so we can manualy check our system.